A growing number of U.S. utilities are engaging their customers through voice-activated devices. Google wants to make that easier. Over the past few years, we’ve been tracking the rise of voice-activated devices like Google Assistant and Amazon Alexa in U.S. homes, along with the efforts of utilities to use these platforms to engage their customers. On Thursday, Google announced its latest work on this front: a new developer program that’s allowing some of the country’s biggest utilities and the companies that work with them — like Tendril and Oracle’s Opower — to more tightly integrate their technologies. In simple terms, the new application programming interfaces that Google is now making available to utility developers have codified and “template-ized” the years of work Google has done with its various utility and energy partners, to make future utility deployments much simpler, faster and cheaper to implement. “Utilities will always want some sort of customized development,” Hannah Bascom, head of energy partnerships for Google, said in an interview this week. “But the stuff we’re doing now, we really see as foundational” for any utility interested in tapping the capabilities of voice-activated devices (VADs). Google has plenty of experience in the utility sector, from Google.org’s PowerMeter experiment, to long-running partnerships with utilities using Google’s Nest smart thermostats for customer interaction, energy messaging or behavioral or automated demand response. That’s informed some of the key “foundational” capabilities Google is rolling out, such as simplifying the process for linking customers’ accounts between utility and Google systems. That’s a key step for utilities that need both systems to work smoothly together to provide more accurate, useful or prompt responses to their customers’ queries. But the voice-activation support tools being rolled out under Google’s new developer platform are largely built on a pilot project launched last year with Tendril and Indiana Michigan Power, Bascom noted. That’s because it was among the first in the U.S. to stand up a VAD system that promised to interpret and answer a range of typical utility customer queries using real utility data, rather than generic responses such as directing people to utility customer service call centers or web sites. Real, personalized insights are going to be the key to unlocking people’s interest in using their VADs for energy or utility interaction, according to last year’s report from Wood Mackenzie Power & Renewables, Energy Management in the Connected Home. While 48 million U.S. households are expected to use VADs as the central interface for smart home functions in the years to come, most people rank energy management and insight as a low priority behind uses like home automation and security, entertainment and shopping. And while WoodMac has identified more than 15 North American utilities that support VAD interactions, most of them competitive energy retailers offering devices as a way to win customers, “the capabilities have so far been limited to basic information on energy consumption, savings tips, bill-pay capabilities and utility contact information,” WoodMac analyst Fei Wang noted. For utilities to get customers to use their smartphones, home automation systems, VADs, or any other consumer electronics device to start caring about their energy use, “a crucial step” will be “to engage customers with personalized insights,” Wang states in the report. And once the technology has understood the question, it takes data analytics to provide a useful and acceptable answer, Bascom noted. Simple systems might provide generic, easily ignored advice to upgrade insulation or switch out light bulbs, or supply the phone number and hours of operation of the call center. But data-informed systems might be able to actually explain a bill's more complicated aspects, or perhaps, identify failing air conditioner or refrigerator compressors, or advise people to shift voluntary energy usage like doing the laundry to times when energy is cheap, not expensive. 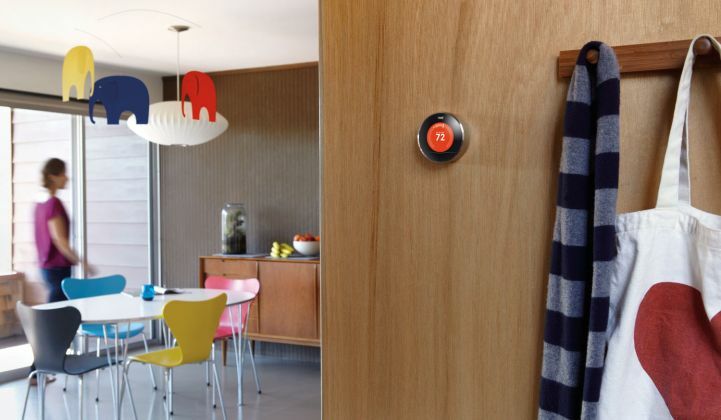 Texas energy retailer Reliant Energy, one of the first to offer Nest thermostats to customers en masse, is now offering Google Home Hub devices to customers who sign up for its "free nights and weekends" plan, Bascom said. Since these plans also include times of the day when electricity is more expensive, it’s important for Reliant that the system be able to tell customers how to schedule and manage their energy usage based on real data, she noted. Google has been working with other utilities beyond I&M on VAD capabilities, Bascom said. Other partners include Southern California Edison, a big user of Nest thermostats for demand response, New York City utility Con Edison, and Midwestern utility Xcel Energy. Google is also working with a variety of companies that are close utility partners on customer data management and interaction. That includes Tendril, Opower and Silicon Valley startup Bidgely, each of which is working with utilities on how to engage customers on behavioral energy efficiency and demand response, as well as to manage customer-utility interactions. Bascom estimated that the work Google has put into its new developer program will allow utilities to deploy complex VAD systems in less than half the time of a custom deployment, from up to six months to less than three months. But she also noted that Tendril, Opower and Bidgely “have all the capabilities worked out” to support an even more rapid deployment for the utilities they already work with. It’s important to note that Google and Amazon are locked in an epic competition over the VAD market, with Amazon in the lead at present, giving utilities and technology vendors like Tendril reason to work with both companies on VAD capabilities. “We know that there’s going to be a couple of ecosystems that people are going to care about developing toward. Google is one; Amazon is another. Maybe Samsung is a third; maybe Apple will come up with something at some point,” Bascom said. But she also noted Google’s history of working with utilities and on energy issues for more than a decade, as compared to Amazon’s more recent entry into the field, such as its partnership with smart thermostat startup ecobee. “We have a much more refined perspective on the energy industry, with a much clearer vision of where we’re going and what we’re doing,” she said. Join us in San Diego, June 18-19, for two full days of data-intensive presentations from the leading grid edge research practice in America and industry-led discussions on how data analytics, AI, DERMs and other smart grid innovations are enhancing grid reliability, optimization and planning. Learn more about Grid Edge Innovation Summit here.